The mission of the Grants Steering Committee for the Houston Global Health Collaborative is to fund global health service projects, research projects, and educational programs designed and executed by Houston-area students in the health professions. The purpose of the Committee, as a subsidiary of HGHC, is to empower students to develop projects and leadership roles in the advancement of global health in Houston and other Texas communities, as well as abroad. Congratulations to Neima Briggs and his team of fellow student researchers from the National School of Tropical Diseases! His work to understand soil-transmitted helminthes in Honduras exemplifies the type of globally-important research and institutional collaboration taking place in the Texas Medical Center. 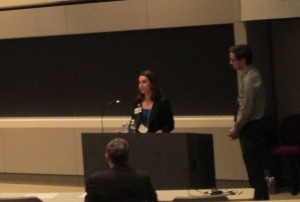 HGHC Grants chair, Erika Wood, presents Mr. Briggs with his award at our annual global health conference. John Collier, Executive Director of Caring Friends, Inc., helped secure funds for our essay scholarship and travel grants. 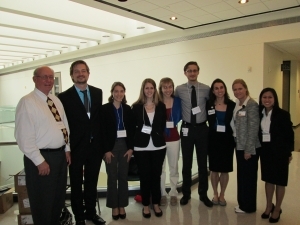 The recipients of the essay scholarship, given to graduate and medical students who incorporate the ethics of global health within a comprehensive worldview, are shown in this picture. For a list of past grant recipients, please click here.